Why are in the newer versions the sides cut? I think it disturbs the reading flow and it’s even separating in the middle of a sentence. he went boom. tell us about boom. i wish a character that isnt in this was the main character. This is one of the best “reincarnated OP MC” manhuas on the internet today. Please don’t go into Hiatus!!! Update more please!!! It’s not on hiatus. You can find the latest chapter on mangadex and other sites. It updates weekly. First off - I like this one. Always eagerly waiting for the next chapter. But there’s one glaring plot hole that always bothers me - why doesn’t he seek help? At 1st he was just a commoner which noone would take seriously. But now he’s got enough connections to people openminded enough to believe his story and offer help. So why the stand alone complex? That’s not a plothole at all. Do you really think that they would believe that he came from the future and knows what’s gonna happen? Why would they believe a a low tiered magician who just arrived in their academy? Asking an author to go beyond his own wish fulfillment….haha. You should read the start again because you missed the mc’s backstory. I mean are you serious bruh the manhwa only has 49 chapters at the moment and you forgot why he befriended her first? This, Skeleton Soldier, and Peerless Dad have already been updated. Feelsgoodman. Out of all the projects they have, they decide to drop this one, big mistake. they got a cease and desist letter. they had no choice or they would be sued. 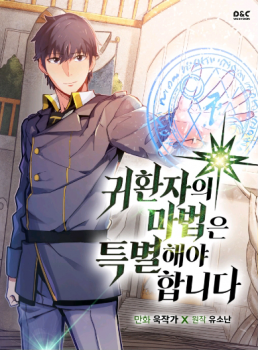 Is there a light novel for this manhwa? its suddenly stop updating, hmmm..
Read last page people, that way you’ll know the news from the translators. There are only 3 chapters of the light novel translated and it looks like it was dropped over a month ago. Awesome to have the latest English updates as same as raw… thank you. you rock! why do I always need MOAR!!!!! Whoa, curious bout the request. I really thought he’d just gonna tell dumbledore that he’s back in time then make plans. Four chapters behind, thanks to whoever picked it up. New chapter(s) today or tomorrow? The double finger-guns was over the top chuuni. Downgrading my rating to Average. Nobody cares and most disagree with you, all your comments shows is what kind of person you are. Just for this you downgrade the manga? WOW! I bet you must have a lot of friends. Oh noooo a 12 year old is monologging me for having an opinion! I repent and retreat! guys, where’s the bathroom please? i dont feel so good mr desir…..
why would it have a divine javelin of light? i have not seen it have one. Damn the quality of this surprised me. On the side note, I hope the story would be like ToG here - making use of test rules to propell the story and not just focusing on the tests. So far it’s doing a rather nice job. Manhwa is up to 42, weekly updates. Translated, bi-daily… so we’ll be caught up in 2-3 months. Yippee. Don’t sleep on this one, it’s not as fast paced as solo levelling, but I have a feeling the story will be really good… I like it so far. who? this place doesnt do it. so… the world is waiting for his doom, and the only way to prevent it is to build a skilled party that can solve the test but their priority is social status over talent? logic. I think the world doesn’t yet know, it’s ending. @Cimerea what do you mean the world still doesn’t know? they obviously know the characteristic of shadow world so they create party / teach student to prepare for it. no matter what if they failed the test on shadow world, the part of the world will be occupied by the shadow that no living being can live in there.. that pretty much spells doom for me if they screwed it. Wow, raws are up to 36! Thanks man! Its nice to have this new manga, how that it will continue to update. Oh boy, another of these. I hope its good.